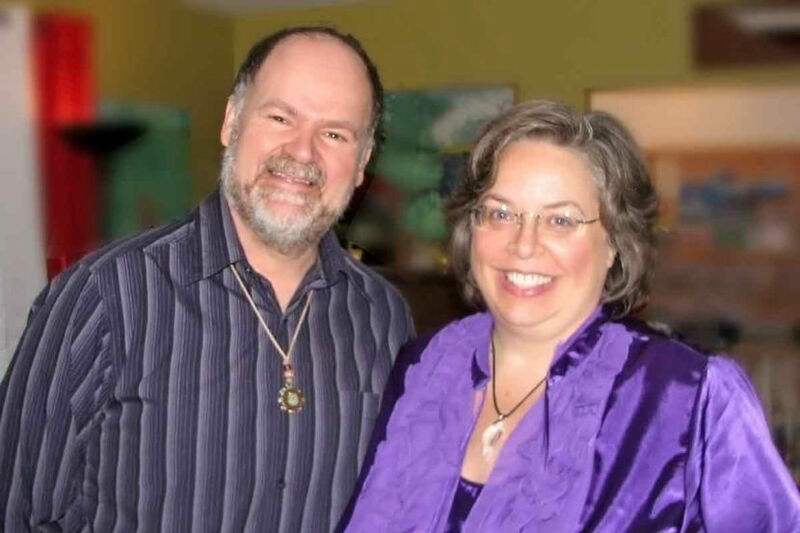 We are a husband-and-wife team of holistic healers. Clayhut is a marriage of our last names. Steve specializes in Vibrational Energy Healing for People and Pets. He is a certified Reiki and Chios Healing Master, with training in EFT (Emotional Freedom), Crystal Healing, and Living in the Heart. Steve belongs to The Alliance of Professional Naturopaths and Naturotherapists and is the founder of the Riverview Holistic Fair. Kim specializes in Multidimensional Healing & Guidance. She is an Angel Therapist and Chios Healing Master, with training in Reiki, Crystal Healing, Crystal Reading, and Ascension Mysteries. Kim organizes the Riverview Holistic Fairs; is a guest authors at In5d.com, and was featured in Newsweek's Spiritual Living Special Edition. Throughout his life, Steve was told by many people that he had great energy, and that his hands could naturally take away other people's pain. Despite these affirmations, Steve did not realize his healing gifts until he had a spiritual vision from his totem. One winter's night, Steve dreamed of eagles who asked for his help in rebuilding their nest that had been destroyed by heavy snow. When he awoke, Steve discovered his plum tree lay broken; another victim of winter's punishing snow. He cut her branches, loaded them in his trunk, and headed to work in northern New Brunswick. Following the eagles' instructions from his dream, Steve pulled off the road, grabbed the bundle of branches and trekked into the woods to a clearing where the nest lay broken. Steve left the branches as an offering to the great birds. In the ensuing weeks, the eagles busily constructed their new home with the plum tree branches. On subsequent nights, as Steve drove past the nest, the eagles would stop to watch him intently, telepathically expressing their thanks. The eagles revisited Steve in a subsequent dream to tell him they chose him, and that he was to use his gifts to guide and heal others, animals and humans alike. Kim was born 'awake'. Incredibly, her memories go all the way back to the womb. She's been in communication with angels since early childhood. Kim's nightly activities included sleepwalking, flying and lucid dreaming. Young Kim's deepest desire was to become a mermaid; instead, she fulfilled to her desire to help people by becoming a teacher. She later left the classroom, and began a personal healing journey, after her Kundalini Awakening. She met her spirit guide Crystal, a young Navajo woman, who took Kim by the hand and flew them into a clear quartz crystal. This was a gateway to the Portal of Light, a colourful cluster of musical stars that Kim's recognized as her brothers and sisters. Kim met another guide, a young boy named Emmanuel, who lived in a red rock canyon. He introduced himself in a dream. Kim then awoke to see him standing in front of her, laughing and playing peak-a-boo. Months later, she saw a magazine article about Sedona, Arizona's miraculous healing powers. It featured a photo of a red rock canyon identical to her dream, and another of a boy who resembled Emmanuel. Kim travelled to the land of her dreams where she visited mystical vortexes and found her soul's home on Earth. Steve's soul has been incarnating on Earth for more than 250,000 lifetimes. He has experienced life in every form including crystal, tree, animal, and even gnome! Of his 200 human lives, many were spent as a shaman / healer / physician. Steve is, therefore, powerfully attuned to Mother Earth's loving healing energy. This past life experience, coupled with the Gaian connection, enables Steve to expertly heal the energy fields of people and animals. Additionally, Steve is joyfully connected to his higher selves in 4D Andromeda, 5D Pleiades and on the angelic home world in the seventh dimension. This higher connection provides Steve with unconditional love and helps him to channel pure Source energy during his healing sessions. Kim is a Blue Ray starseed from the Pleiades in the fifth dimension. She has successfully completed the full circuit of the multiverse three times, and volunteered to return for a fourth time as a mission specialist. She heard Gaia's call for assistance, and came here to help with the ascension process by raising the vibration, and expanding the consciousness, of life on this planet. She is aided by her higher selves who include the angel Christos, who is an 'architect of the universe', and a 9th dimensional blue star. Her soul joyfully journeys throughout the multiverse and in the Void where she communes with Source.